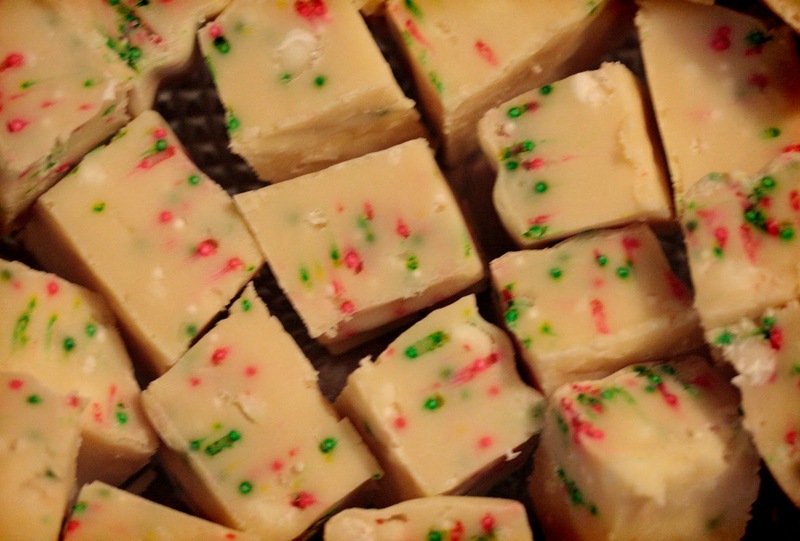 Here's the recipe for the white fudge. Sort of a different take on the Christmas favorite. Great texture! Pour milk and white chocolate into a microwave-safe bowl. Heat for 2-3 minutes, or until white chocolate is almost completely melted. DO NOT OVERHEAT. Stir until completely blended, melted, and smooth. Immediately add vanilla and almond and combine thoroughly. Add a handful or so of rainbow sprinkles and fold in quickly, because they will melt (and if they are stirred for too long they’ll turn the fudge an ugly muddy color). Transfer to an aluminum-foil lined 8×8 inch baking pan. Let cool. Once set, cut into cubes. Store in a cool place.